$1.66 Per Month – How Much More Convincing Do You Need? I thought the prices at BudgetFocus were good already. But right now? They’ve knocked a huge chunk off the price, which means we’d all be crazy if we don’t jump on this. For less than $20.00 for the entire year, which breaks down to a hair over $1.66 per month, you can have access to everything BudgetFocus offers. Their site walks you through setting up your budget, offers you an awesome online envelope system, helps you keep track of your spending, and provides you with great information and guidance. Do this. Feeling confident about your budget, no matter how much or little your income, is so beneficial. This price will not be available forever. Get it now. Get your budget under control and organized. I can’t think of a better investment in your financial peace. I’m pretty sure none of us really cares about being rich. But I do know that most of us appreciate financial security – the peace that comes from knowing that bills are paid and needs are met. This week, BudgetFocus is offering Heavenly Homemakers readers a lovely Mother’s Day gift: They cut the price of their annual budget plan to just $19.95. Did you do the math on that? That’s only $1.66/month – incredible! Buy this for yourself for Mother’s Day. Ask your husband and/or kids to buy it for you. What an amazing price on an amazing resource. I think you’ll really love their online envelope system. Hooray for getting the budget in line so that you can live in financial peace. Happy Mother’s Day, and thanks BudgetFocus! 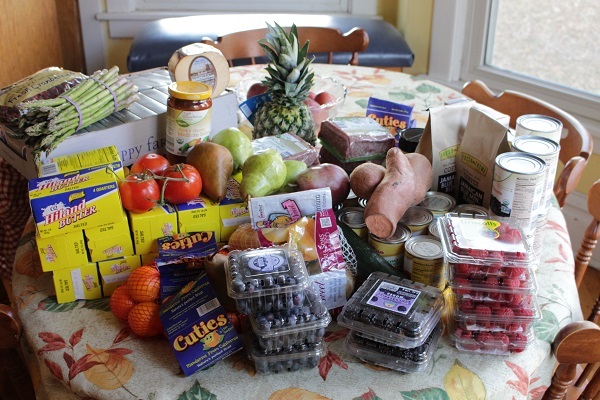 Well, please don’t forget everything – just the parts I shared a few years ago about how I can feed my family of six a whole foods diet for less than $500 each month. See, I thought my kids ate a lot of food at that time (2011)…because they did. They’ve always been very active and have had hearty appetites. But now? Well, we can polish off 2 pounds of meat, 2 pounds of strawberries, 1 pound of frozen vegetables, 5 pounds of potatoes, and a half gallon of milk – in one meal. An hour later they’ll need (and I do mean need, not want) more food, so we’ll eat a bowl of apples, four bowls of popcorn, and a hunk of cheese. Can now eat his weight in bulk groceries. And he’s the youngest one of the bunch. You should see his 6’3″ brother eat. Those 50 pound bags just don’t stretch as far as they used to. But that’s just a warm-up. An appetizer. A teaser plate. They polish that off and go back to heap more onto their plates, twice, or maybe three times – if there’s anything left. I typically have to act quickly if I want seconds (or firsts as is the case at times). I love this. Feeding people is fun for me, watching my family eat great food is a joy, and observing healthy appetites does my heart good. 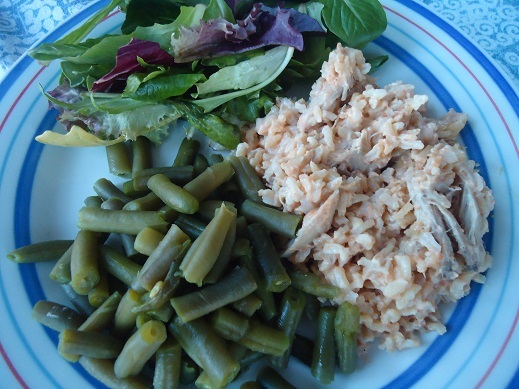 Bring on the food, bring on the appetites, bring on the healthy eating! 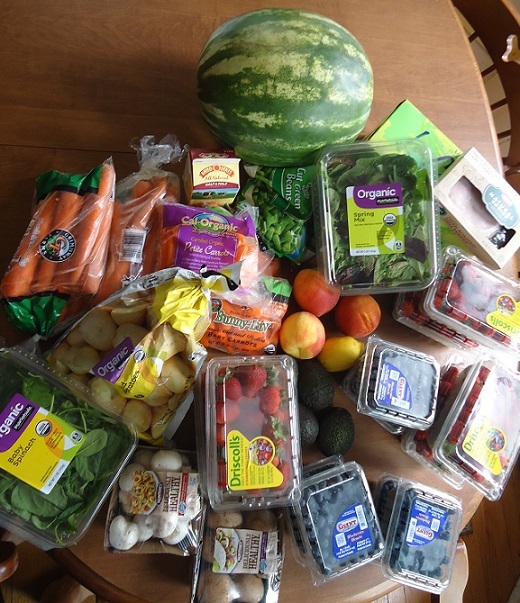 But it does come with a price tag – an ever growing price tag that sometimes shocks me, especially when see the shopping cart, the bulk co-op purchases, the cases of food delivered to my door – and I know how long the food will (won’t) last. 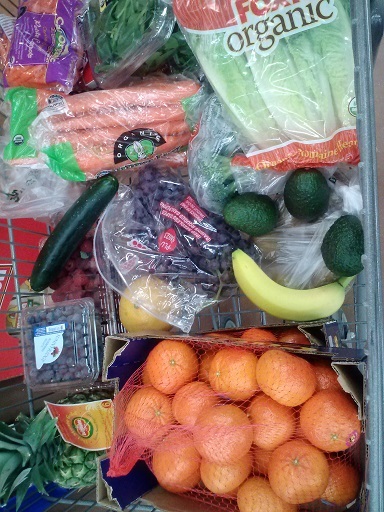 This is what my grocery cart usually looks like (weekly) – filled with fruits and veggies to go with the farm fresh meat, eggs, and milk – plus all of our bulk food purchases. 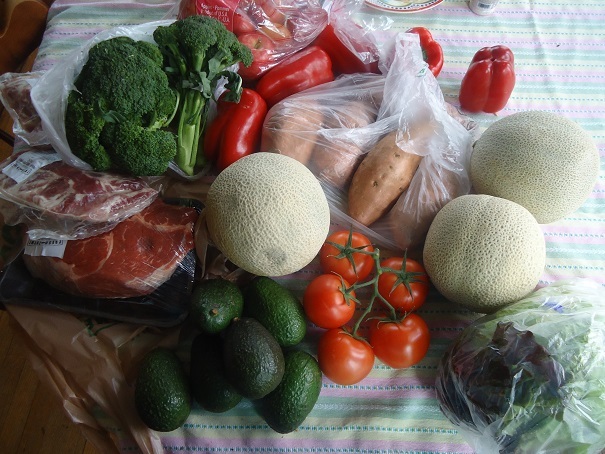 Our grocery budget increases, but only because we’re eating more food, and there’s not much I can do (or want to do) to change that. If they are hungry, let them eat. Just save some for me, boys! To accommodate the changes in our grocery budget, we’ve had to shuffle some numbers around in our overall budget. Eating is not an option. The money has to come from somewhere, right? So where has it come from? Well, as we’ve taken a look at all the line items in our budget, it can look at first glance as if there is no flexibility. After all, we try not to spend money on anything we don’t feel is necessary, so what can we possibly cut out? Nothing, really. And while I’m on the subject, can I tell you how nice it is to have a clearly itemized household budget so that we can put a name on every dollar we earn and spend? There is so much comfort in this, even if there are sometimes question marks about how to adjust those numbers. What has worked for our family is this: Our boys are now able to earn money by doing various jobs such as mowing lawns, raking leaves, shoveling snow, babysitting, and other miscellaneous jobs people call on them for. Our two oldest boys are licensed soccer officials, which means that in the spring and fall they are called to the soccer fields 4-5 days/evenings each week to referee games. They are good at what they do, they enjoy the work, they earn nice paychecks, and they are good savers. So guess what? 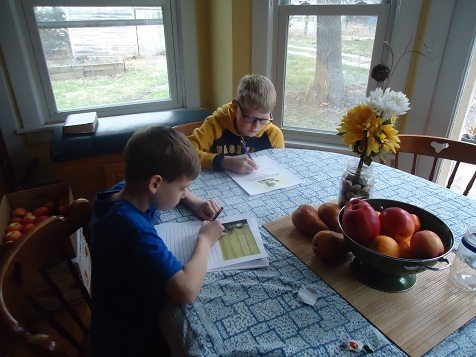 In an effort to both help our household budget and teach them how to manage money, our boys have become more responsible for purchasing many of the items they need. As a result, we’ve been able to shift some money from our clothing budget over to our grocery budget. 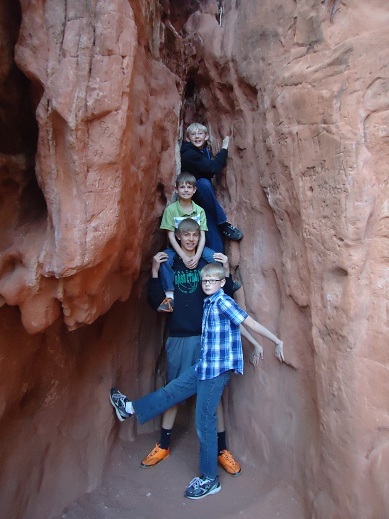 We let the boys pay for their own outings with friends, church youth functions, part of church camp costs, etc. Aha! It’s a win-win. The boys get to continue eating (you’re welcome, children), plus they learn about budgeting for themselves. 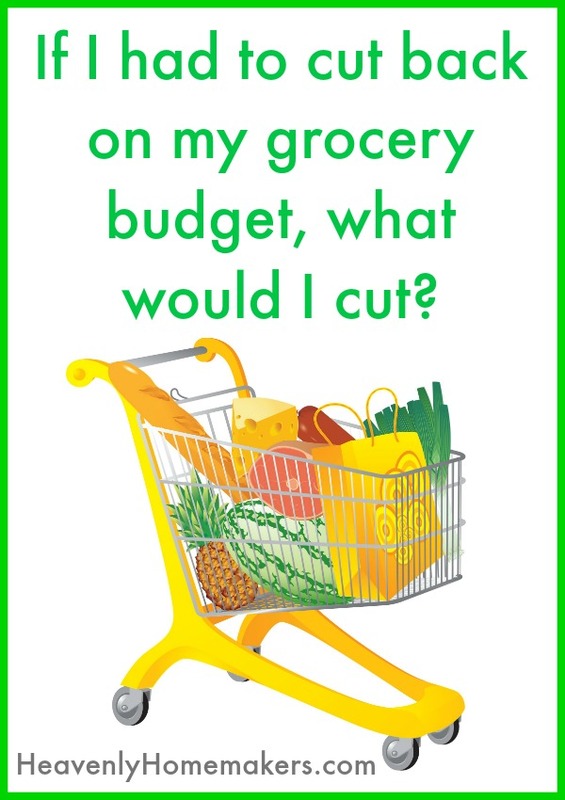 I’d love to hear how you manage your grocery budget, how you cut food costs, and how you teach your kids about managing money. Also, I want to encourage you to take advantage of what BudgetFocus offers in the area of setting us a specific (but simple!) household budget. I love this resource! Through Mother’s Day, they knocked down the price of an annual plan to just $19.95 – a super deal! 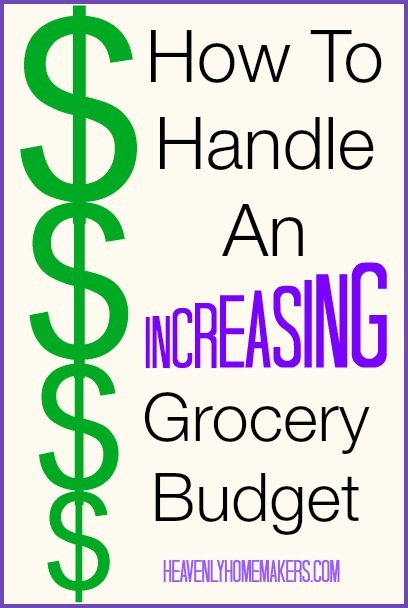 Now let’s talk grocery budgets. 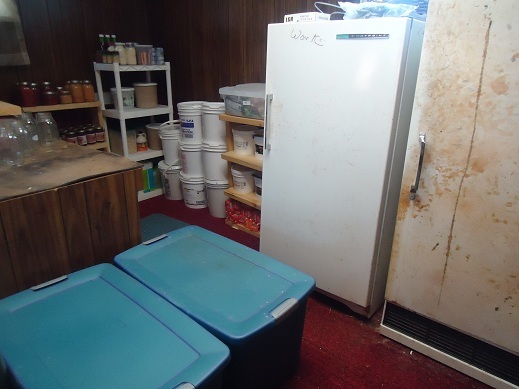 How are you holding up with growing appetites at your house? We can be super smart with money, always buy items on sale, shop around for the best deals, and stay perfectly within our budget each month. We can live very frugally, make food and household items from scratch, recycle, reuse, patch, repair, and gratefully accept hand-me-downs. We can work hard, pay off all our debt, build up our savings account, and put ourselves in a wonderful position financially. Awesome. Go you! Rock that budget. Being wise with our money is just what we’re called to do. Becoming financially free is a tremendous blessing. I will forever and always work toward this and encourage others to do the same. 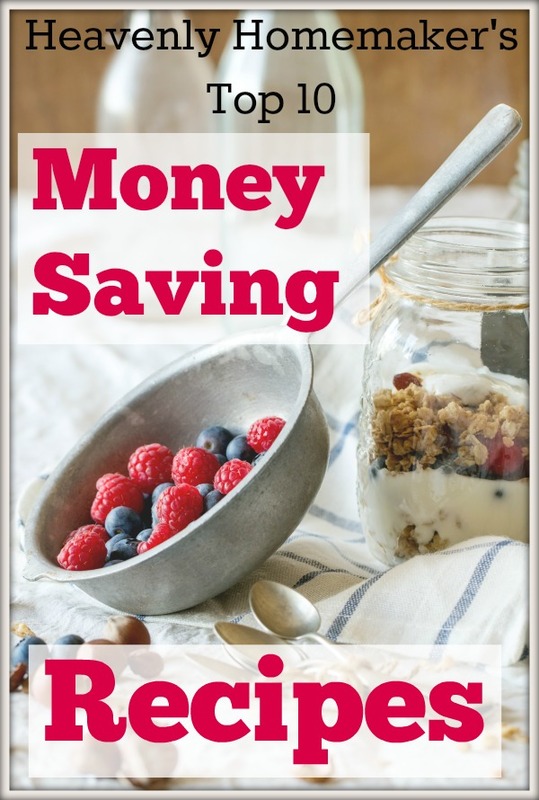 But if we aren’t working to be financially savvy for the right reasons, all of our money-saving, frugal, happy budgeting ways are really for nothing. We can, of course, decide that focusing on money is a bad thing, and therefore scrap the budget altogether. We can buy the newest and best of everything. We can rack up credit card debt so that we never have to deprive ourselves of anything we want. We can throw money at all forms of entertainment and not really be sure where our money went at the end of the day. We can fly by the seat of our pants, not really paying attention to our wallet or the bank account or the pay check. It’s just money, right? Whether we’re talking about spending or saving, I believe we’re called to be wise with our money so that we can be a blessing in God’s kingdom. If we’re so hung up on padding the savings account that we can’t see the needs around us – we’ve missed the point. If we’re so into stuff and splurges that we lose sight of those whose basic needs aren’t met – we’ve missed the point. I believe that if we truly want to be financially free, we have to learn to let God be in control of our money. Every decision, every investment, every expense, every gift, every penny stashed away into the savings account – every line item in our budget. We are all blessed so that we can be a blessing. Your budget can help you be the blessing to others that you are called to be. Are all of our budgets going to look the same? Will all of our spending priorities jive with everyone else who is working to be wise financially? 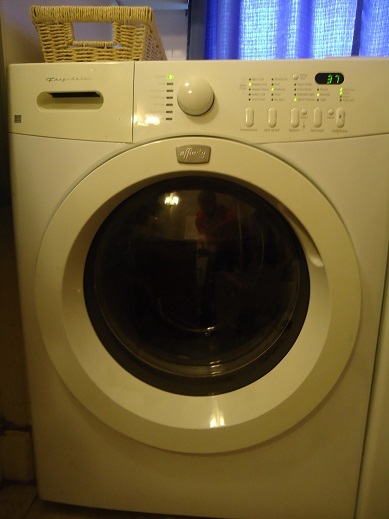 Will we all need to start darning socks and making homemade laundry soap in order to be considered a wise steward? No, no, and I hope not. After all, you could fit the entire state of Nebraska through the holes in the socks we finally threw away last week. Let your budget be a blessing – to your family and to those you minister to. Because that, my friends, is the point. Want some help getting your budget on the right track? Already have a great budget, and want to dig deeper? BudgetFocus is a great resource, and I highly recommend it. Use the code HH33 to receive 33% off a 12-month plan. Can’t go wrong with a great discount like that! After so many of you shared within the comments of our BudgetFocus giveaway post your desire to get your budget on track, I am so excited to share this big discount with you! Ladies, email me and I’ll forward your info on for your free annual subscription! And now, the wonderful discount. I feel that the price options for BudgetFocus are already very reasonable. For as little as $5.00 each month, you’ll be guided through setting up and keeping a workable budget for your family. Now, with a special temporary discount they are giving Heavenly Homemakers readers, you can enjoy this service for as low as $3.33 per month! Isn’t that awesome? Head over to BudgetFocus. Use the code HH33 to receive 33% off a 12-month plan. This cuts the price of an annual plan to just $39.99. What an amazing price on an amazing resource to get you on your way to financial freedom! Take advantage of this deal for just three weeks. I love the idea some of you suggested to buy this as a wedding gift to help couples get started on the right track with their finances. 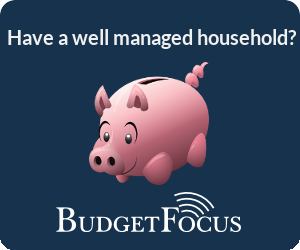 Whatever your need, BudgetFocus will take all the difficulty and confusion from budgeting. Is It Worth Spending Money On a Budgeting System? Plus a Budget Focus Giveaway! What can you get for five bucks? A coffee at your favorite coffee shop. A bucket of popcorn at the theater. A box of cereal and a container of cookies. All fun things, and items people often toss out five dollars for without much thought. But what if? What if, for just five dollars per month, you could find financial security and peace? What if, instead of blowing a few bucks here and a few bucks there, with nothing to show for it, you could put just five dollars each month into getting yourself on the right track with your budget? Would it be worth it? Well, I’d say it would be very worth it. 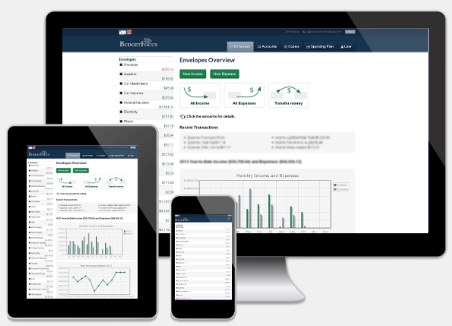 If you are ready to be in control of your money, I really want to encourage you to sign up for BudgetFocus. It is such a simple system, and it will walk you through every aspect of setting up and sticking with a budget. For as little as $5/month ($59.99 for an annual plan), you’ll be all set up with a spread sheet, online envelope system, and all the guidance you need to set up and stick to a workable budget for your family. Five dollars a month. That is a tiny price to pay for a system that can change how you manage your money. What a breath of fresh air! BudgetFocus even offers everyone a free 14 day trial period just so you can get started and see how great it is. 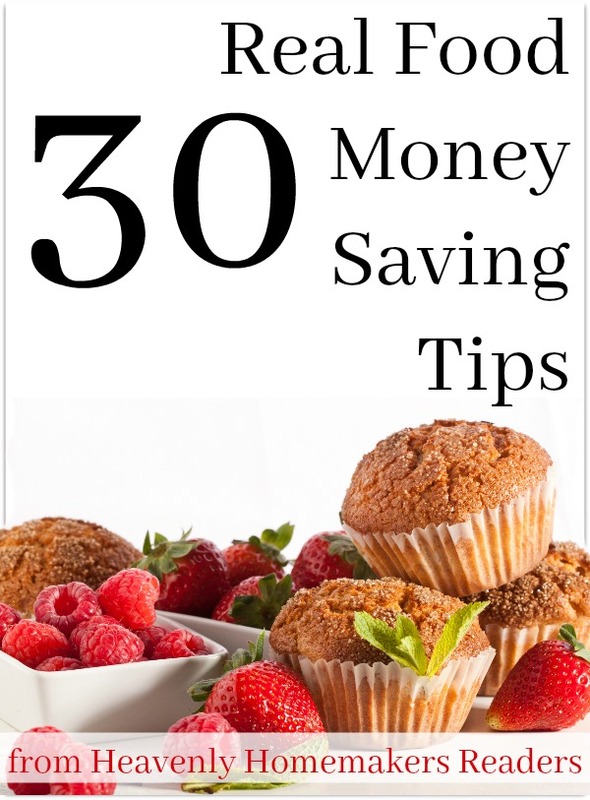 After that, you can pay monthly, or purchase a discounted twelve-month plan – a very inexpensive resource for budgeting! Now here’s the very fun question for you: Who wants to win a year’s worth of Budget Focus services for free?! BudgetFocus is giving away two annual plans this week. Interested in winning? Leave a comment on this post for a chance. I’ll draw two random winners on Wednesday, April 2. Be watching for a post stating the winners as you will be responsible for contacting me if your name is chosen. In the meantime, check into the pricing plans offered by BudgetFocus. Try it for free, then consider investing in all they offer you. It’s money well spent. After all, what do you have after spending five dollars on cookies? I think we all know. :) But five dollars for a budgeting system? Relaxed, stress free financial planning. Love it! Recently, our two youngest boys came to me very excited. Something they wanted was on sale – today only! They had discussed it at length (a solid five minutes, I’m sure) and decided that they would like to pool their money to purchase it. They eagerly asked me if it was okay. focused while carefully writing scripture? Mmmhmmm. I had mixed feelings. The boring mom in me knew that they definitely didn’t need the item. But the fun mom in me knows it’s okay to spend a little money on fun sometimes. Our boys are all very good savers. They rarely spend their hard earned money or birthday money, and in fact, they rarely even ask to spend it. I knew that since they were asking, and since they’d already discussed how to go in on it together, the purchase was important to them. If this item wasn’t on sale, would you still want it this badly? Or do you just think you want it because it’s on sale today? It started a great discussion, which of course ended with the boys asking, “um, so can we buy it?” Clearly, I had been able to make my nine and twelve year old think deeply, and offered them life-lessons that they’ll take with them long into adulthood. After talking it over with Dad, we came to the decision that since it was such a huge discount, and only totaled $5, their purchase sounded like a fun idea this time. While five dollars doesn’t sound like a big deal, and while it might seem that our dilemma and discussion was silly over such a small amount – we feel that every financial decision needs to be talked through, especially at their ages. Throwing money at this and that is a great way to end up with an empty wallet. We felt it was important to take advantage of that teachable moment. So how about we adults? What factors into our decisions as we decide what to spend our money on? Do you frequently make impulse purchases, buying something that is on sale whether you need it or not? We’ve been talking recently about budgeting and the envelope system as we all work together to let Budget Focus get our finances on track. I’d love to hear what helps you process your spending decisions. 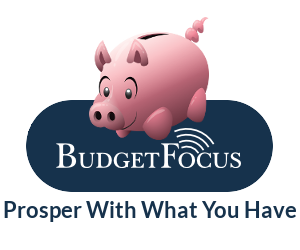 Also, I’d love to hear from those of you who have taken advantage of the free 14-day trial at Budget Focus. Have you plugged in all your numbers into their simple budgeting and online envelope system? 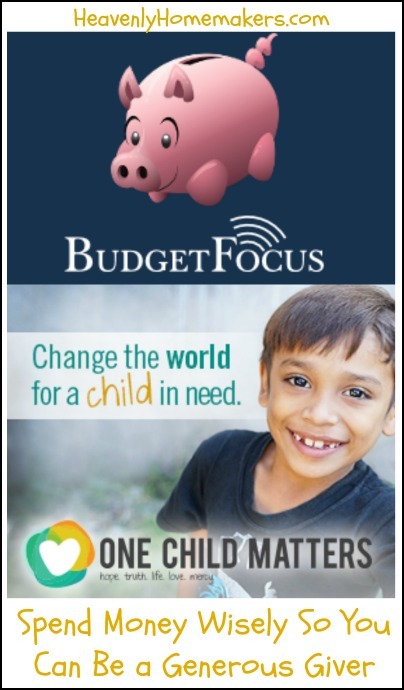 I encourage you all to check out what Budget Focus has to offer. You can try it for free, and their pricing packages are worth paying for as a way to help you get your budget organized and running smoothly. How do you help your kids make a purchasing decision?